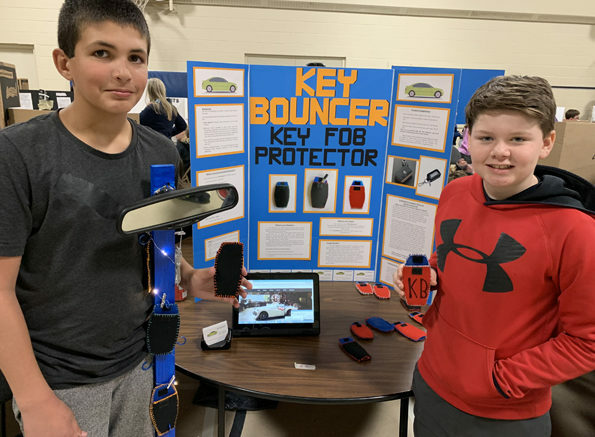 Ethan Tahamtan and Ryder Thompson show off their Key Bouncer key fob protectors during the J.J. O’Neill Kidpreneur fair Friday afternoon. Photo by Adam Bramburger. The gymnasium at J.J. O’Neill Catholic School was filled with a potent mix of creativity, enthusiasm and salesmanship Friday. At the school’s second annual Kidpreneur fair — one of many at area schools as part of a Lennox and Addington County economic development initiative — Grade 6-8 students were showing off their own big ideas for a chance to sell products and compete against some of the top young entrepreneurs in the area. A number of the wares on display were born out of personal experience and purpose. One inventor created a bicycle rack for his fishing rod so he didn’t have to carry it. Another built a tree to dry hockey equipment. Jake Perry cut out coasters because he was tired of his mom scolding him for leaving drinks out on wooden furniture. Ryder Thompson and Ethan Tahamtan, who partnered last year for a winning natural air freshener, eyed a different target market. Thompson recalled his mom telling him about how hackers can emit a signal that scrambles car key fobs and leaves car owners vulnerable to theft. There have been complaints even in Napanee about the suspicious behaviour. They started manufacturing prototypes that would place aluminum inside a pouch that could cover a key fob, to protect it from the signal scramblers and also scratches. After experimenting with different sizes and stitching, there was a prototype. They tested it and confirmed it would work to block transmission of signals. Product research continued. The boys surveyed 10 people and found nine would use their product every day. Data also showed 85,000 vehicle thefts in North America in 2017.Then, they also looked on sites like Amazon and eBay to find prices for similar products. They ranged from $10 to $45. A decision was made to market the product for $12.99, which represents a $6 profit once all the materials and a labour cost of $3.75 per unit are accounted for. The target was clearly adults, Thompson said. Besides an eye-catching display and a welcoming approach, Tahamtan said the company, which was marketed as Key Bouncer — referencing the protective qualities of bouncers keeping undesirables out — also has business cards and a web site. He continued that beyond sales at the fair, they’d like to approach local car dealerships about selling logoed products — with a small percentage kick back going to the dealers. Down the aisle, Perry had no trouble approaching strangers cold to talk about his range of outdoorsy products. Last year, he developed a healing pine pitch salve, made of pine needles, resin, charcoal, sunflower oil and beeswax. On Friday, it was selling quickly at his booth. Those who tried it felt that it worked well. This year, Perry added to his brand with woodworking products. He made a campy bench out of maple and hard wood, cut his wooden coasters, and designed a line of walking sticks. “I did this all myself, it’s all handcrafted,” he said. Like his peers, Perry compared prices and found a market for his wares. He’s found Kidpreneur to be a rewarding experience. Perry said he’d give serious thought to running his own business later in life. The County’s Kidpreneur Fair, featuring the top 90 projects will be April 30 at the L&A County Museum.